Its really important to track the holidays when you plan work ahead. But most of the online digital calendars that we use these days don’t have in built option to add the holiday calendar for Sri Lanka. Add the Sri Lanka Holidays Calendar 2016 to your digital calendar. Download ICS format SRI-LANKA-HOLIDAYS-2016 . Dear Malinga, thank you for uploading the holiday calander. I am using Office 2016 and would like to add the holidays to my existing calander in Outlook. Can you please guide me to to do so? I’m a Linux (Ubuntu) user and have little knowledge on outlook. However i found this in a office support site. 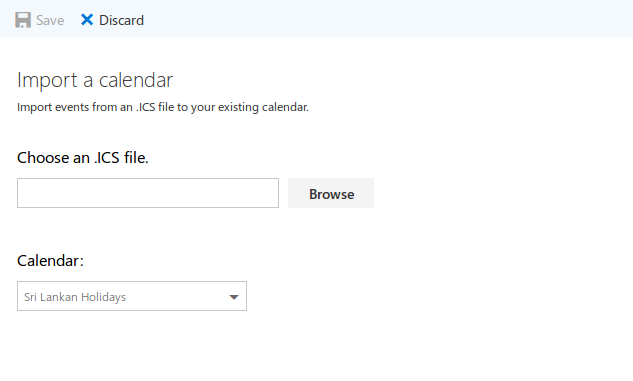 Choose Import an iCalendar or vCalendar file. Browse to where you stored the extracted file and choose OK. It is a big job you have contributed Sri Lanka calendar to be uploaded. Best wishes to your future. Your such attitudes will enlighten this Country. This is very useful. Thank you.